Sometimes a baked potato and a salad make the perfect easy winter meal when you don’t feel like cooking . This easy recipe is a little more interesting than a regular baked potato, but still simple enough to manage without feeling like you are a slave to the stove. 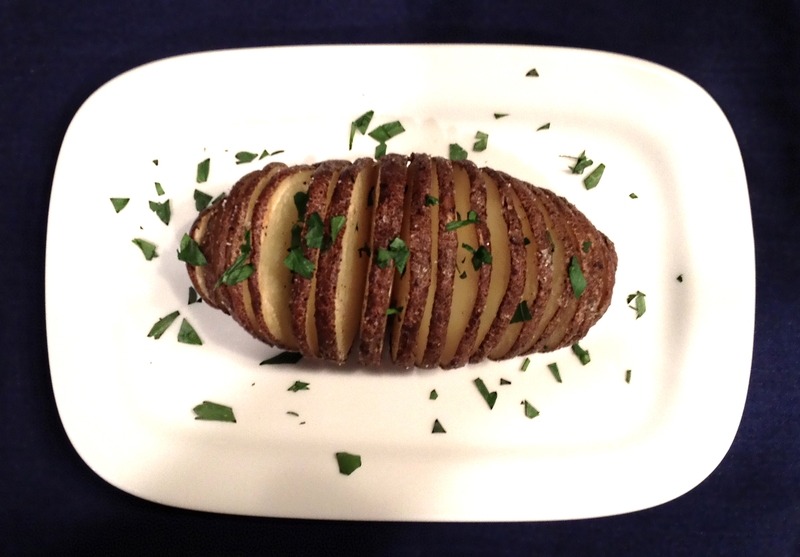 These potatoes are also referred to as Hasselback potatoes, which references the hotel in Stockholm where they were first introduced (The Hasselbacken). I recommend using russet potatoes for the best texture, but other varieties will work in a pinch. Lay potatoes flat on cutting board, if potatoes do not lay flat, cut a thin slice off the bottom of the potato to make it lay flat on the cutting board. Slice the potato cross-wise in 1/4 inch increments to create a "fan". Slice most of the way through the potato without slicing all the way through. One way that you can avoid slicing all the way through the potato accidentally is to lay chopsticks on either side of the potato so that your knife hits the chopsticks and stops before it can slice all of the way through the potato. After you have finished making the slices, rinse the potatoes under running water to wash away the additional starch between the slices. This will keep the separated and allow them to get more crispy as opposed to sticking together and becoming gummy. Allow rinsed potatoes to drain cut side down, then transfer them (still cut side down) to a microwave-safe plate for par-cooking. Cook potatoes on high in the microwave for 4 minutes, then turn potatoes cut side up and microwave for an additional 4 minutes. Remove potatoes from microwave and place them on a baking sheet. Brush the potatoes with the melted margarine or butter using a basting brush. Make sure to get some of the margarine between the individual slices. Season liberally with salt and pepper, and place in oven to cook. Cook in oven for 20-30 minutes, until potatoes are cooked-through and the tops of the individual slices are crispy. Garnish with optional toppings if using.